The Manager/Setup menu is where you set up most of your hotel's data such as rooms and rates. User IDs and permissions are set up under the System Maintenance menu. The Manager/Setup menu contains manager reports. 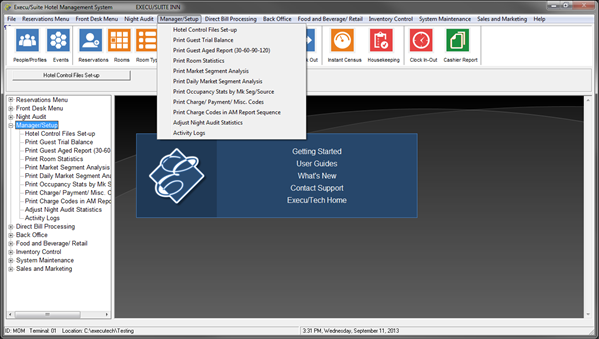 The Manager/Setup menu contains Travel Agency setup, processing, and reports. You can access the Manager/Setup menu from the tree menu at the left of your screen or from the drop-down menu at the top of the screen. Each of the functions and reports will be discussed in the following sections. Additional hotel and point of sale parameters can be set up in the MENUINI.FIL file. User IDs (Employees) and security levels are set up in System Maintenance. Company setup for all profit centers or companies is in System Maintenance. See also Helpful Information .